Morton's neuroma is a benign neuroma of an intermetatarsal plantar nerve, most commonly of the second and third intermetatarsal spaces (between 2nd−3rd and 3rd−4th metatarsal heads) which results in the entrapment of the affected nerve. Sharp radiating exercise-induced pain or dysaestesia between two metatarsal bones, most often between MT III and MT IV, without obvious preceding trauma. There are often bilateral symptoms. Usually it occurs in adults and particularly in middle aged recreational athletes who wear tight shoes. This syndrome is caused by entrapment of an inter-digital nerve between two metatarsal bones arising from a local neuroma or synovitis. Negative signs include no obvious deformities, erythema, signs of inflammation, or limitation of movement. Direct pressure between the metatarsal heads will replicate the symptoms, as will compression of the forefoot between the finger and thumb so as to compress the transverse arch of the foot. This is referred to as Mulder’s Sign. Though a neuroma is a soft tissue abnormality and will not be visualized on standard radiographs, the first step in the assessment of forefoot pain is an X-ray in order to evaluate for the presence of arthritis and exclude stress fractures/reactions and focal bone lesions, which may mimic the symptoms of a neuroma. Ultrasound (sonography) accurately demonstrates thickening of the interdigital nerve within the web space of greater than 3mm, diagnostic of a Morton’s neuroma. This typically occurs at the level of the intermetatarsal ligament. Frequently, intermetatarsal bursitis coexists with the diagnosis. Initially try orthotics to support and lift the anterior foot arch. NSAID or local cortisone injections can give short-term relief. Surgery for excision of the neuroma is indicated in severe cases and shows excellent outcomes. 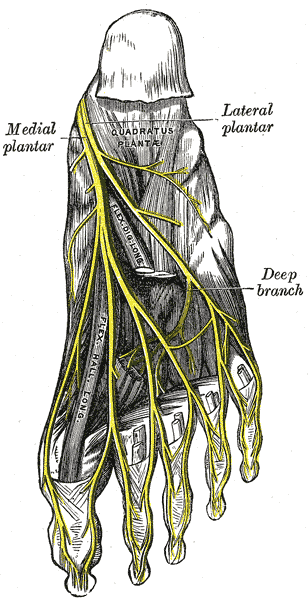 However, the patient will then lose sensation in the area distal to the neuroma, which could be slightly disabling. Surgery is done as a day case and full weight bearing is often allowed within two to four weeks.